Following the runaway success of his Big Book of Numbers and World of Numbers, Adam Spencer is back with a fascinating – and fun! – romp through history. 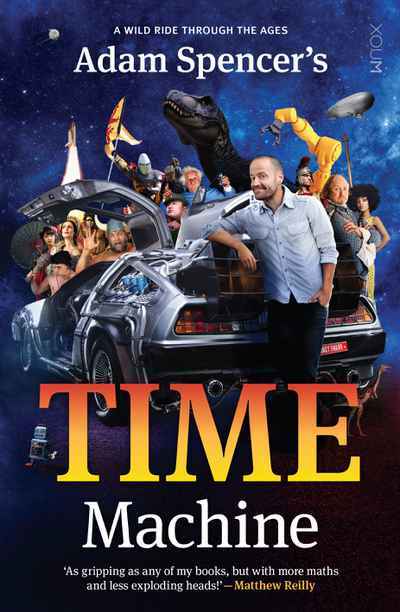 Starting with the big bang and ending in the present day (with a few glimpses of the future for good measure), Time Machine is a history book unlike any other. Jam-packed with quotes, quizzes, anecdotes, and trivia, Adam’s latest book is a full-colour treasure trove for ages 8 ... all the way to 108. Did you know that some of the earliest mathematicians and astronomers were indigenous Australians? Or that Lord Byron’s daughter, Ada Lovelace, was a pioneer of computer programming ... despite dying in 1852? Can you believe that pinball was actually illegal across much of the US until the 1970s? Will time travel ever be possible? And who (or what) is the Witch of Agnesi? Time Machine is 2016’s ultimate compendium for curious minds. Adam shares a few interesting anecdotes from his book here on The Project.